and an Advanced Reading Copy of Foul Play on Words! PLUS one of my handmade book purses! The more actions you complete, the more entries you earn. A few of them you can do every day to rack up points! I’m editing this on March 7th to add that due to oh, about forty-leven gazillion emails from people about how much they love those purses, I’ve made an executive decision to add more winners! If at least 50 people share this post before the contest ends, I’ll offer a SECOND prize of one purse to a random winner. And if I get 100 shares, I’ll offer a THIRD prize of another purse to yet another random winner! So share away … even if you don’t want to win, you have a friend who does! Ends on March 30 … Good Luck! This entry was posted in Authors/Books You Might Like, Giveaways, Writing, Reading and Publishing and tagged Ann Dominguez, book giveaway, Colorado writers, cozy mysteries, Cynthia Kuhn, FICTION CAN BE MURDER, Foul Play on Words, giveaways, handmade book purse, Karen Whalen, Margaret Mizushima, Mary Birk, Nora Page, Shawn McGuire on March 2, 2019 by Becky. I had two books going recently, one nonfiction and one fiction. SCRATCH was a mostly fascinating collection of essays from writers of all stripes talking about the money part of writing. You know, making a living. But the most illuminating one for me was the interview with Cheryl Strayed in which she speaks very candidly about her money issues. She describes being on tour promoting her wildly successful bestseller, WILD, and having her rent check bounce. I don’t think most writers understand the money part of publishing, and I’m sure non-writers don’t. This book can fix that. The second book I just finished was from my friend Gretchen Archer. She writes an absolutely hilarious series of capers set in the world of casinos. DOUBLE DOG DARE is her latest, but I suggest you begin with her first and savor your way through. 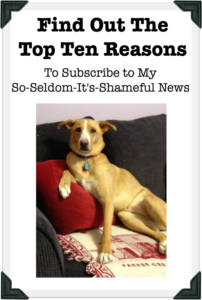 This entry was posted in Authors/Books You Might Like, Favorite Stuff I Read, Writing, Reading and Publishing and tagged Cheryl Strayed, Double Dog Dare, Gretchen Archer, Manjula Martin, Scratch, Wild on January 8, 2019 by Becky. pre-orders available now – just click the beautiful cover! 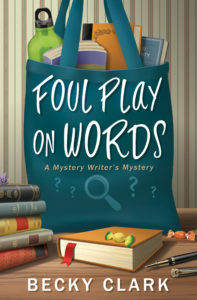 I’m gearing up for the release of FOUL PLAY ON WORDS in April 2019 but I’m not sure what kind of publicity events I should do. They’re all fun for me, but a girl only has so much time! What kind of book events do you like? 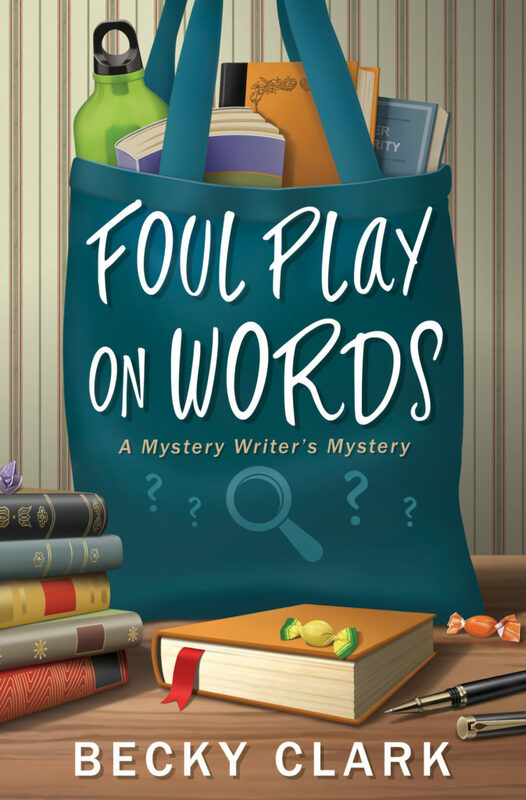 Tell you what … if you comment on this post and tell me what kind of events you like and what you like to hear authors talk about, when I get my Advanced Reading Copies (ARCs) of FOUL PLAY ON WORDS, I’ll pick a lucky commenter (maybe more) to get a copy hot off the press! Also …. I’m contemplating a southern California book tour, maybe in June. If I was in the vicinity of The Book Carnival in Orange, would you come see me? Comment below! And thanks … you’re the BEST! This entry was posted in Behind The Books, The Glamorous Life of a Writer, Writing, Reading and Publishing and tagged Book Carnival Orange California, book events, book launch, book signings, Foul Play on Words on November 12, 2018 by Becky. Can We Have A Peek? Personally, I find it fascinating to poke my nose into the various ways authors have of organizing themselves. So I’ve asked a couple of my writer pals to draw back the curtains on where they make their magic. First up is Catriona McPherson, who writes the funny Last Ditch Mysteries, the historical Dandy Gilver series, and a whole bunch of other award winning standalone mysteries. Here’s the view from my writing desk. I keep all the mystery fiction in my writing room as inspiration and/or pressure to stick at it when the going gets tough. I’ve also got Stephen King, Jane Austen and Dorothy Whipple in there – my favourite writers of all time, dead or alive. My dad made the shelves. He’s been making bookshelves for his daughters since before I was born and this autumn when he comes “on holiday” there are more in the offing, because we’re out of space again. The doll/clown collection is definitely towards the Stephen King end. The view of my desk changes a lot in the course of writing a book. I’m quite tidy as a rule, but first draft production makes a big disgusting mess. When there’s an empty peanut butter jar with a spoon in it, Neil knows I’m getting there. An empty pickle jar with a fork in it usually means I’m on the last chapter. I had to ask Catriona what was on the plate because it didn’t look like pickles or peanut butter, but rather kiwi peels. Lots and lots of kiwi peels. I was wrong. They were artichoke leaves. Next is Philip Donlay, who writes some of the most heart-pounding thrillers around. When you crack the spine on one of his Donovan Nash books, make sure you have plenty of time to read because you won’t want to stop! Speed the Dawn is his newest one. One of the many fascinating things about Phil is that he is a vagabond with no fixed address. He’ll spend six months here, six months there, six months some other place. This is from the house I rented in Pebble Beach for the writing of Speed the Dawn. And here’s where yours truly works. Yes, I stand on a mini-trampoline while I write and Nala waits somewhat patiently for me to be done. If she’s not up here with me, she comes charging up the stairs when she hears the quiet little click of my laptop. When I’m actively writing, I set my timer and go nonstop for one hour. Then I stop and turn on a song and either dance on the trampoline, or use my pink hula hoop to get the blood flowing. Then I do it again for another hour, and perhaps another, but never more than four. If I’m editing on paper, I sit at that table on the big blue ball. You can see my current work-in-progress there in the binder. Just next to that table is a big elliptical machine, my arch enemy. When I feel like punishing myself, I get on that for five minutes. I gaze at the gorgeous Colorado sky and occasionally watch the heron swoop in and steal fish from my neighbor’s pond. I didn’t get a lot of work done when they had two black lab puppies over there. So there you have three completely different offices. I don’t think any of us would work well in the others’ space. How ’bout you? Where do you work the best? 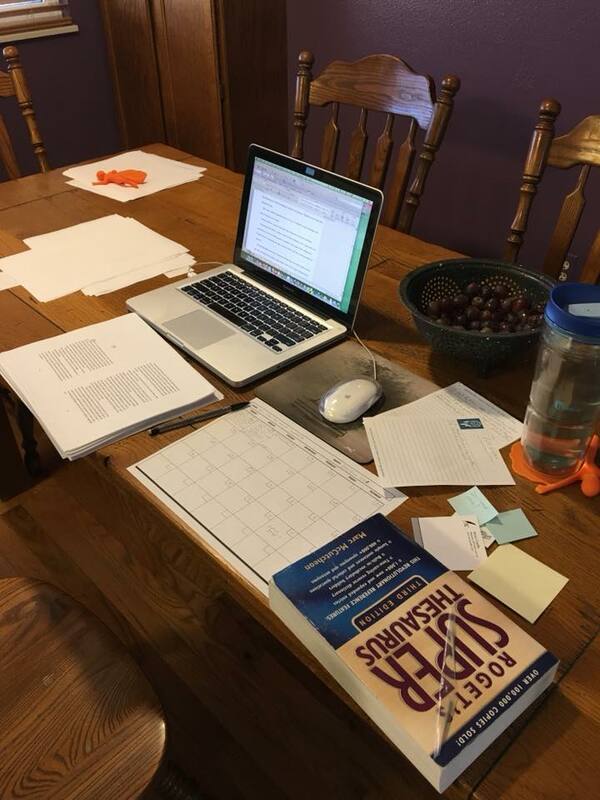 This entry was posted in Authors/Books You Might Like, Behind The Books, Writing, Reading and Publishing and tagged a peek at your workspace, Catriona McPherson, Dandy Gilver, Donovan Nash, Philip Donlay on September 11, 2018 by Becky. I couldn’t stop reading this, absolutely engrossing. Written by a former district attorney about a district attorney, it was full of those “telling details” that give weight to fiction. Literary novel meets legal thriller. The teenage son of the DA was arrested for the murder of a classmate. Roller coaster plot that you’ll want to strap in for. Double thumbs up. I also read HUNTING HOUR by my Sisters in Crime pal, Margaret Mizushima, and highly recommend it. This graphic I made of her Timber Creek K-9 series is not in order. Start with KILLING TRAIL, then STALKING GROUND, then HUNTING HOUR, then BURNING RIDGE. They’re all fantastic. Margaret writes the Timber Creek K-9 mystery series featuring Deputy Mattie Cobb, her K-9 partner Robo, and Cole Walker, DVM. KILLING TRAIL, book one in the series, was nominated for an RT Reviewer’s Choice award for Best First Mystery, and STALKING GROUND, book two, was named a finalist in the 2017 Colorado Book Awards mystery category. I find it fascinating that she assists her husband with their veterinary clinic and Angus cattle herd. Writers are just fascinating people, I guess! This entry was posted in Authors/Books You Might Like, Writing, Reading and Publishing and tagged Defending Jacob, Hunting Hour, Margaret Mizushima, what I'm reading, William Landay on September 4, 2018 by Becky. A couple weeks ago I finished the first draft of METAPHOR FOR MURDER, the third book in my Mystery Writer’s mysteries. I learn â€” or relearn â€” something with each manuscript I write. Two things got my attention this time. One, I should have gone back to read pertinent parts of FICTION CAN BE MURDER to reacquaint myself with some characters I hadn’t seen in awhile. I took too much of my writing time trying to remember the nuance of some of my people. It bogged me down and zapped my momentum. Two, my vision for the final showdown was weak. And this actually happens all too often. I think, because the story is so much in my head that I expect I know the blocking of the scene better than I really do. I need to take more time with the minutiae of important scenes like this. Again, it slowed me way down and annoyed me. Now I’m well into the revision stage. This is where I fill in all the blanks I left. When I’m writing the first draft, instead of going backward to find and fix something I’ve already written, I leave notes to myself … He should have called her at some point during the day …… check the timeline, should it be dark yet? I also write some fairly boring sentences, with a lot of bland or repetitive words, passive verbs, and incomplete description. Then during Phase Two, when I make that first revision pass-through, I know I have to plug those holes or look up some minor research question right away. I have to stop and determine what Peter O’Drool’s squeaky toy is going to look like (rainbow-colored plush flamingo, for those of you playing along at home). I have to look up potentillas to remind myself what color their flowers are (yellow). I have to decide on all the questions those toddlers are going to ask before I move on (so … many … questions!). Even though it slows me down in Phase Two. But by the time I get all that done through the entire manuscript, I get to go back to page one, this time grounding the reader in the story using all the senses, adding layers of theme and emotion, making the funny bits funnier, the mystery bits more mysterious, the clues more hidden or maybe more visible, the writing more vibrant. It sounds like work, but what do they say about doing a job you love? You’ll never work a day in your life. Remind me of this when I’m in full-fledged tantrum mode, hating both my book and myself. Do you keep statistics on your progress for anything? Do you find it as comforting and as fascinating as I find my stats? Do you think it keeps you on track or otherwise benefits you? I also track my weight first thing every morning and I know that keeps me a bit more honest with my food choices during the day. This entry was posted in Behind The Books, Writing, Reading and Publishing and tagged Becky Clark, FICTION CAN BE MURDER, first drafts, Mystery Writer's Mysteries, revision, series writing, write fast on August 13, 2018 by Becky. I’m a proud, dedicated member of Sisters in Crime, an organization whose mission it is to support women mystery writers. (Misters do this too, in case you were wondering!) I helped start our Colorado chapter a few years back. It has been by far one of the best things I’ve ever done, personally and professionally. Members get lots of benefits from the national organization of SinC, but I’m wiggly with excitement about something coming up in a couple of weeks. National has created a Speaker’s Bureau of prominent and prolific Sisters in Crime members. At no cost to the chapter, they pay for these speakers to come and present workshops and other events for us. The board of our chapter requested that Nancy Pickard come to speak to us so I’m fully immersing myself in her mysteries. I started with THE VIRGIN OF SMALL PLAINS, which hooked me from the first few pages. Small Plains, Kansas, January 23, 1987: In the midst of a deadly blizzard, eighteen-year-old Rex Shellenberger scours his fatherâ€™s pasture, looking for helpless newborn calves. Then he makes a shocking discovery: the naked, frozen body of a teenage girl, her skin as white as the snow around her. Even dead, she is the most beautiful girl heâ€™s ever seen. It is a moment that will forever change his life and the lives of everyone around him. The mysterious dead girlâ€“the â€œVirgin of Small Plainsâ€â€“inspires local reverence. In the two decades following her death, strange miracles visit those who faithfully tend to her grave; some even believe that her spirit can cure deadly illnesses. Slowly, word of the legend spreads. But what really happened in that snow-covered field? Why did young Mitch Newquist disappear the day after the Virginâ€™s body was found, leaving behind his distraught girlfriend, Abby Reynolds? Why do the townâ€™s three most powerful menâ€“Dr. Quentin Reynolds, former sheriff Nathan Shellenberger, and Judge, Tom Newquistâ€“all seem to be hiding the details of that night? Seventeen years later, when Mitch suddenly returns to Small Plains, simmering tensions come to a head, ghosts that had long slumbered whisper anew, and the secrets that some wish would stay buried rise again from the grave of the Virgin. Abbyâ€“never having resolved her feelings for Mitchâ€“is now determined to uncover exactly what happened so many years ago to tear their lives apart. Three families and three friends, their worlds inexorably altered in the course of one night, must confront the ever-unfolding consequences in award-winning author Nancy Pickardâ€™s remarkable novel of suspense. Wonderfully written and utterly absorbing, The Virgin of Small Plains is about the loss of faith, trust, and innocence . . . and the possibility of redemption. As soon as I finished that one, I cleansed my palate with the last three short stories from an anthology by one author that was disappointing so I won’t mention it. It was touted in a national magazine, and as I’ve been trying to write a short story, I thought it would be wise to read really good ones. Alas, these I did not find “really good.” The search continues, however. Then I picked up Nancy Pickard’s THE SCENT OF RAIN AND LIGHTNING. One beautiful summer afternoon, Jody Linder receives shocking news: The man convicted of murdering her father is being released from prison and returning to the small town of Rose, Kansas. It has been twenty-three years since that stormy night when her father was shot and killed and her mother disappeared, presumed dead. Neither the protective embrace of Jodyâ€™s three uncles nor the safe haven of her grandparentsâ€™ ranch could erase the pain caused by Billy Crosby on that catastrophic night. Now Billy Crosby is free, thanks to the efforts of his son, Collin, a lawyer who has spent most of his life trying to prove his fatherâ€™s innocence. Despite their long history of carefully avoiding each other in such an insular community, Jody and Collin find that they share an exclusive sense of loss. As Jody revisits old wounds, startling truths emerge about her familyâ€™s tragic past. But even through struggle and hardship, she still dares to hope for a better futureâ€”and maybe even love. Again, as with Pickard’s other book, I was immediately captivated. She has a distinctive way with language, and her descriptions are so spot-on, you could swear you’ve already been wherever she’s describing. Pickard has tantalizing mysteries and story questions that I can’t wait to learn. I raced through 100 pages of it on a lazy Sunday afternoon. I’m only halfway through, but I suspect I’ll continue to be surprised and engrossed through the last word. Are you a Nancy Pickard fan? In addition to these two books, she has 16 others. Have you read any others? This entry was posted in Authors/Books You Might Like, Favorite Stuff I Read, Writing, Reading and Publishing and tagged Nancy Pickard, Sisters in Crime, The Scent of Rain and Lightning, The Virgin of Small Plains, what I'm reading on July 3, 2018 by Becky.